9th April 2016 was not a happy night for me. Two passes of the ISS and the Dragon supply vessel predicted, one at 8:40 p.m. and the other at 10:15 p.m. Sky clear!! Moon setting at 10:39 p.m. and small phase only – so no problem. Everything perfect for a unique image. 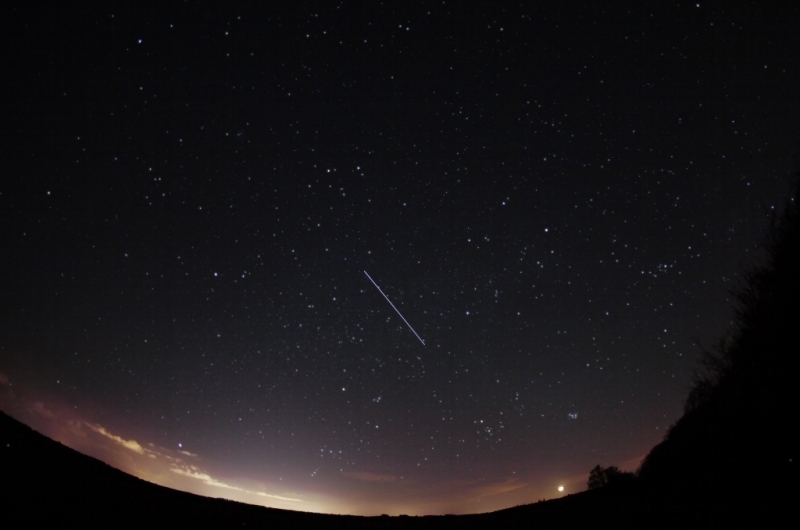 So I’m set up in the garden for the 8:40 p.m. pass, I see the ISS approaching and open the shutter. As it is still fairly light I am taking a set of 10-second exposures. As the ISS reaches the Zenith I can actually see the Dragon supply ship off to one side – brilliant – I haven’t seen it before 🙂 🙂 I keep taking shots until the ISS is well out of the FOV – brilliant – what a happy occasion. So I packed the camera up to bring the data indoors for processing – AND – yes the lens cap was still on. I don’t think I have gone quite so ballistic for a number of years – and of course I have NEVER left the lens cap on the camera ever before. O.K. well I still have the 10:15 p.m. pass – but it is so low down I need to go over the forest to take the pictures. No problem – load everything into the car and go over to a forest car park to get next pass. Well that’s an eye opener!! Didn’t realise that sort of thing went on in my local forest car park after dark!! Undeterred I pressed on (the others discretely pushed off while I was setting up) and I got the image below. The first part of the pass was lost from car headlights from a car coming back from deeper in the forest, but I got the main part of the ISS pass. However I didn’t get, and I didn’t see the Dragon supply ship which was basically the whole point of the exercise. Not a night to remember!